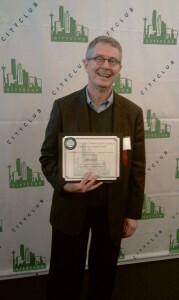 Congratulations to Bill Zosel for winning a City Club People’s Choice Award!! Bill, the Mayor of 12th Avenue, has been a tireless advocate for the neighborhood and so deserves this recognition. He has been the driving force behind the 12th Avenue Stewardship Committee, been very active with the Squire Park Community Council, and been involved in everything happening in the neighborhood, from the First Hill Streetcar, new park design, planning the City’s first woonerf, and participating in citizen advisory committee for Seattle University. The word has been out for some time about the future retail tenants at Trace Lofts on the corner of 12th and Madison. We’re getting closer though to having some great new spots opening in the neighborhood! Barre3, a pilates-yoga-ballet barre studio, is set to open for classes November 29. We’re super excited to finally have that vacant corner filled…and especially excited since these are all great, community-serving tenants (not lame check cashing joints). The latest on the digging at 12th and Jefferson! The 12th Avenue Stewardship will not be meeting at its usual time (the second Tuesday) this month. Instead, we encourage all of you to take the time to attend a special town hall meeting with King County Councilmember Larry Phillips discussing transit, future budget issues, and findings from the regional task force. While this will be a larger conversation about King County Metro, we may have the chance to bring up 12th Avenue and Central Area transit needs, particularly the opportunity to move a bus line to 12th Avenue when the First Hill Streetcar is finished in a few years on Broadway. Hope to see you next Tuesday at this important meeting!